Snackable entertainment, That Moment When is a short form (8 minutes) weekly lifestyle narrative hosted by Steve Goldbloom (creator, PBS’ Brief But Spectacular). That Moment When offers revealing insights into the critical moments that alter the course of a person’s career or shapes who they become. 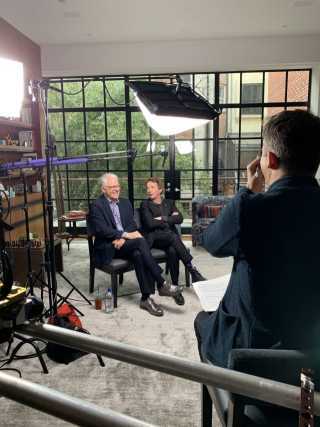 Guests range from Gloria Steinem, Bryan Stevenson (Just Mercy), and Margaret Atwood (The Handmaid’s Tale), to Steve Martin and Martin Short. Every Tuesday brings a new dose of happiness, inspiration, and wisdom to make your week. Whether your interests lie in entertainment, food, sports, books, or movies, there’s an episode for everyone. Creator and interviewer Steve Goldbloom is also the force behind the wildly successful Brief But Spectacular, a weekly segment on PBS NewsHour that invites the viewer to walk in someone else’s shoes. Currently in its fifth season, the series features Goldbloom’s interviews with more than 250 people and has earned over 300 million views. Guests range from the well-known (Ta-Nehisi Coates, Alec Baldwin) to the lesser known but maybe even more popular guests, including 91-year-old former teacher Flossie Lewis, who did a segment on growing old that generated more than 7 million views that led to a flood of social media posts and outreach to Lewis.